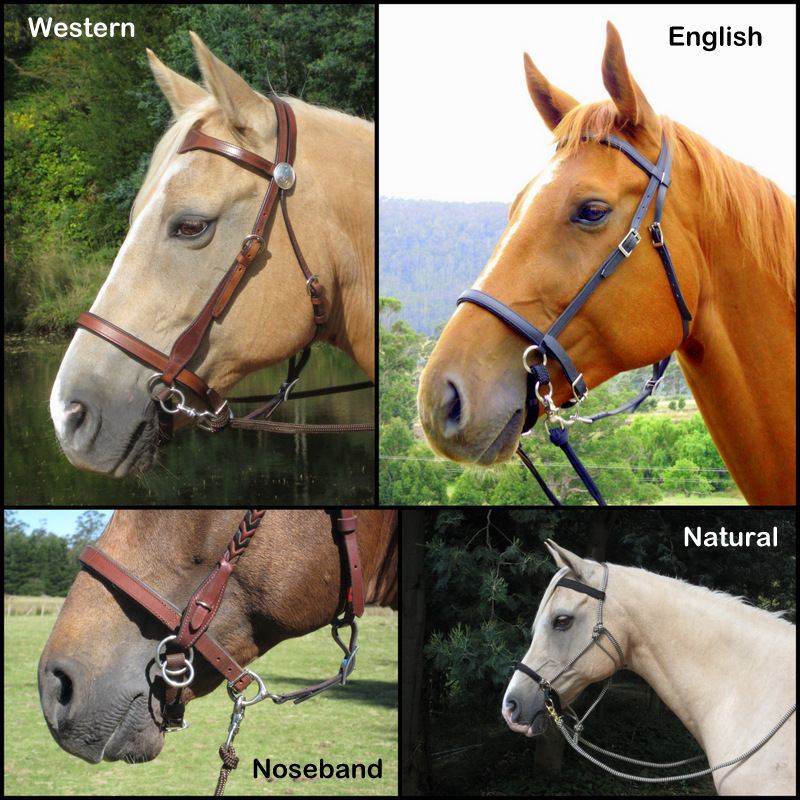 A list of differences between the bridle styles and the materials they are made from. The English, Stockhorse and Western styles all work the same, the only difference being that the Stockhorse style has a ring headpiece allowing the browband to self-adjust it's position. It also has a solid padded headpiece. The English beta biothane and Western style have a split headpiece that is flexible so the browband can be moved or changed easily. The Western style features scalloped cheeks and browband with silver conchos and the deluxe biothane has a plaited horsehair browband and plain cheek pieces. The Euro and Dressage bridles have a single padded headpiece with a raised leather browband and noseband. They are made of high-quality english leather. The English style has a single padded headpiece and flat padded noseband made from drum-dyed leather and also comes in Beta Biothane. The Natural and Performer Rope Bridles are made from high-quality marine grade polyester rope. The two styles are essentially the same with the Natural having a webbing covered noseband and brass rings, while the performer has an anti gall padded noseband and stainless steel rings. It's firm yet soft and durable unlike cheap polyethylene and polypropylene ropes typically seen in hardware stores. Polyester will not harden or break down with age. It is not affected by water, will not rot, mold or mildew, and is resistant to most acids and oils. Cheap polypropylene halter cords and webbing have a much lower breaking strain (about 30% less) and lose another 30% per year through age. Polyester ropes lose only 3% per year making ropes that can be relied on for much longer. Fully washable when it gets dirty - just throw it into the washing machine to look good as new. Polyester can be washed with normal household detergents in warm water. Colourfast - will have only minor fading over the long life of the rope. Low abrasion - polyester produces less friction so that means a greatly reduced chance of rope burn and less abrasion on your horse’s skin. Polyester is the material that most marine ropes are made from and is used on the outside of climbing ropes to protect them from abrasion. High-tech ropes use polyester to protect them from wear and UV light. All LightRider Bitless Bridles feature the unique chinstrap that snugs up when in use and releases when the pressure does (when fitted correctly). The chinstrap will not tighten or 'clamp' down on the horse because the material folds around the noseband ring. 95% of the pressure is on top of the horse's nose. The rope styles can also be used as a very gentle straight sidepull by clipping the noseband and chinstrap rings together. LightRider Bitless Bridles are one of the gentlest bitless bridles available and are usually very well accepted by sensitive horses while being effective enough to control stronger horses with correct education. To understand how the LightRider compares to other styles of bitless bridles please read this article: Choosing the Best Bitless Bridle for Your Horse. Beta Biothane is the genuine USA made Beta Biothane with the bridle being manufactured in India using quality hardware. Regular leather is top quality drum dyed leather manufactured in India. English Leather is better quality 'english' (softer and more supple) leather with the bridle manufactured in India. BioThane is nylon webbing covered with thermoplastic polyurethane (looks shiny). Beta BioThane (sometimes just called "Beta") is a newer version of BioThane that uses a softer vinyl coating that is not as shiny so looks closer to leather. In addition to abrasion resistance and cold weather flexibility, products made with Beta BioThane are lightweight, easy to clean simply by wiping off with a damp cloth, durable, don't absorb water, and resist chafing. It does not crack or peel in heat or cold, does not get stiff when cold, and stays flexible over its lifetime. It does not chafe your horse, but it is slippery when wet. BioThane® will form to your horse after use, and it should outlast and outperform both leather and nylon! Beta has the same features as BioThane but looks and feels like leather. A vinyl coating is used instead of Urethane. It remains pliable with less maintenance than leather.